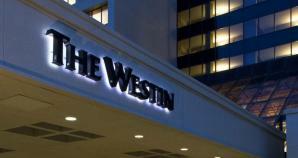 Find the best of yourself at The Westin Tysons Corner. After a recent $22 million renovation, our hotel offers all the personal touches you need to retreat from the rigors of travel and emerge revitalized and renewed. Located in the heart of the Tysons Corner neighborhood and convenient to shopping and major highways, our hotel is also minutes away from the dynamic city of Washington D.C. A rich and vibrant shrine to American history, Washington D.C. also offers world-class dining and shopping. -Dogs up to 40 pounds are allowed. -No other pets are permitted. -Your dog must not be left unattended in a guest room. -If there is damage to the room that exceeds $50, the guest is responsible for the charges at checkout. -Dogs must stay on the 2nd or 3rd floor. Additional Metro Info: Shuttle service available from 9:30am to 10:30pm. Shuttles leave every hour on the hour and on the half-hour.